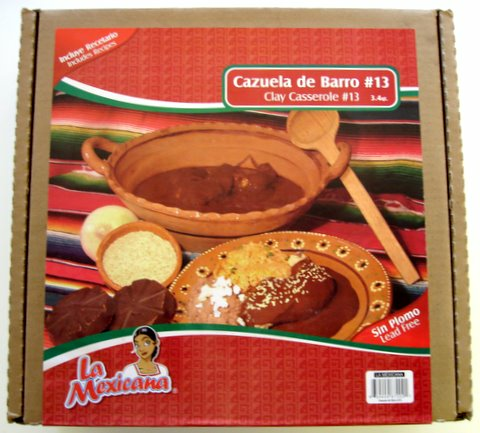 Clay Cazuela for Mole Poblano Sauce and to prepare your favorite Mexican dishes. The best way to cure a lead free clay pot is filling it with cool water below its rim, bring water to a boil and allow to simmer for 5 minutes, turn off the heat and allow to cool the water and pot (olla frijolera), discard the water and thats all you need. The clay pot is ready for use! Clean your cazuela de barro with with a paste of salt or baking soda and water; avoid dishwashing liquids or soaps, scrub it with a plastic scraper or soft brush. 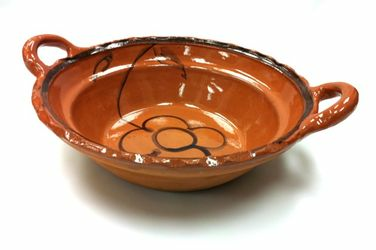 Cazuela de Barro #13 Sin Plomo 34 cm diametro x 10 cm altura. Cazuela para preparar mole, cocinar frijoles o su platillo Mexicano favorito. We got our first on in the mail and it was damaged upon arrival and as soon as I called they processed a new one with no hassle. Can not wait to cook some mole this spring. This is a beautiful piece. When I don't use it for cooking, I set it out as a decorative item. I made a budin in the cazuela and it cooked beautifully. The food was evenly cooked and came out of the over very hot. Clean up was very easy. Warm, soapy water removed all of the traces of the cooked meal. I cured it a little differently. A chef recommended that I soak the cazuela overnight in a solution of 1 part vinegar to 2 parts water. The next morning, I dried it, coated it lightly with oil, and set it in a cold oven. I turned the oven to 350F and left the cazuela in there until the oil began to smoke (about 30-40 minutes). I removed the cazuela, let it cool, and it worked wonderfully. I was told that process would allow for easier temperature transition on stove top and in the oven. I would definitely recommend this item. This was gift for friends that have an extensive collection of cookware and glassware from Mexico. They loved it and it fits well with their collection. I love my casserole dish and use it for mole, but I would have liked to seen it painted more decoratively.